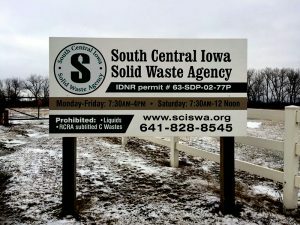 The South Central Iowa Solid Waste Agency (SCISWA) is a four-county intergovernmental organization serving Lucas, Marion, Monroe, and Poweshiek Counties in Iowa. SCISWA’s area, which was formed in 1994, consists of 26 towns, including Victor in Iowa County. The counties and cities in the SCISWA area joined forces so they could manage waste in the most effective and cost-efficient way possible and to better meet state and federal regulations. The SCISWA landfill—formerly the Marion County Landfill—is located near Tracy, Iowa, on approximately 600 acres that once was the site of a strip coal mine. SCISWA operates a transfer station near Malcom in Poweshiek County where waste is collected and then hauled daily by semis to the landfill in Marion County. The Board of Directors normally meets at 9:00 a.m. the second Wednesday of most months at the landfill.